One of the great uncertainties for human beings are the natural disasters that can happen at any moment, usually without warning and in magnitudes that exceed the immediate capacity of reaction of both parts, inhabitants and authorities in the regions in which such events occur. These events are commonly known as “natural disasters” because of the effects they produce in a short and long period of time. The state of Alaska is a region with high rates of telluric movements, this is because Alaska rests on two tectonic plates called “The North American Plate” and “The Pacific Plate” which form a subduction zone that causes the Pacific plate to move and to be placed constantly under the first plate, the North American plate; thus creating movements that result in tremors and earthquakes of which Alaska has good knowledge of. In the telluric history of the Pacific Northwest region, region to which the state of Alaska belongs, there have been many earthquakes among which we will name two. The first occurred on a Good Friday, March 27 of 1964 with a magnitude of 9.2 that devastated the state and the population. 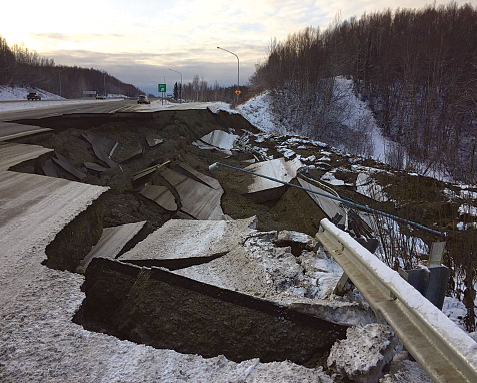 The second, the strongest and most intense after the 1964 earthquake, happened on November 30, 2018 alerting the inhabitants of the southcentral region of Alaska; it started at 8:29 in the morning, with a magnitude of 7.0 on the Richter scale and with an epicenter 12 kilometers north of Anchorage. Due to the proximity and superficiality of the epicenter, the earthquake was felt with great intensity in Anchorage, the largest city in Alaska. The earthquake caused a large number of damages to the infrastructure of the city, such as roads, avenues, schools, stores and large numbers of losses in private property. Among some of the consequences, in addition to the aftershocks that kept the population in alert for several days, schools in the Anchorage school district as well as the university were closed for a week. We must mention, that there were no casualties. • Always keep medical information of family members and pets on hand. • Maintain and secure information on financial matters and property insurance. • Make or buy first aid equipment for the house and vehicle: first aid medicines, water, canned food and thermal clothing. • Make a quick communication plan with family and friends: telephone numbers of family and friends, telephone numbers of contacts outside the state or outside the country. • Choose and decide a meeting and meeting place with family, friends and neighbors. • Investigate and study the emergency protocols of the places where you spend most of the time. • Develop action plan and / or evacuation near and far from home in case of an earthquake. • Plan alternative care plans according to the needs of each member of the family.